Controversies and Bollywood go hand in hand. Each day celebrities get involved in some or other controversies. Some fall into trouble over their statements while some get involved due to their much in limelight personal life. But there is no denying that celebrities love being in the limelight, be it for right or wrong reason. 2017 has been no different! 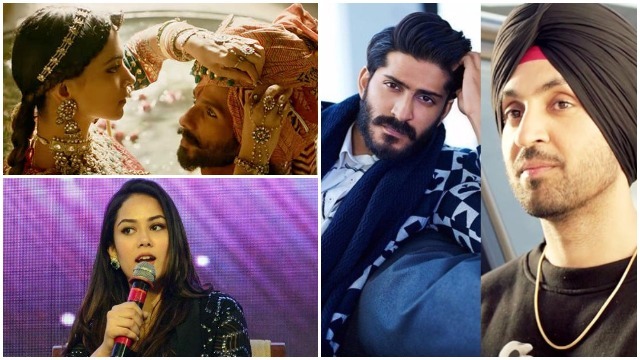 From Kangana Ranaut to Karan Johar, Mira Rajput Kapoor and others, B-town celebrities left no stone unturned to keep the year as busy as they can with new controversies each day. 1. Mira Rajput’s views on motherhood: Little did Shahid Kapoor’s wife Mira Rajput know that her statement on motherhood can raise criticism. It was her first public appearance without hubby Shahid Kapoor and things turned up unexpectedly. This comment did not go well among many working women’s. Shahid’s wife was criticized by many working women’s through open letters. 2. Salman Khan misquoted: Like always, Salman Khan once again landed into trouble during the promotions of his film, Tubelight. The Sultan star was asked about his opinion on ‘War’ as his film had a backdrop of India- China war. However, some of the journalists misquoted his statement and linked to the current tension between India and Pakistan. 3. Kangana Ranaut’s NEPOTISM comment on Karan Johar: Kangana had accused Karan Johar on his show ‘Koffee with Karan’ for the existence of nepotism in the industry. This turned out to be the hottest debate of the year and it still continues. After the episode, even Karan Johar took a dig at her and accused Kangana of playing the ‘victim card’. From Varun Dhawan to Arjun Kapoor, Alia Bhatt and many other star kids were asked to put their views on Kangana’s comment about nepotism exits in the industry. 4. Sonu Nigam’s tweet on Azaan: Sonu Nigam’s one tweet took social media and industry by storm. One morning, the singer took to twitter and wrote, “God bless everyone. I am not a muslim and I have to be woken up the Azaan in the morning. When will this forced religiousness end in India.” This led to a huge religious intolerance debate. Later, a cleric from West Bengal had issued a fatwa against singer Sonu Nigam for speaking out against Azaan. Sonu Nigam indeed shaved off his head after the fatwa was issued against him. 5. Kangana Ranaut attacks Hrithik Roshan again: The ‘Queen’ actress has to be the most controversial lady of 2017. The actress demanded an apology from Hrithik Roshan on TV show ‘Aap Ki Adalat’. The actress, who was promoting her film Simran, opened up about her affair with Hrithik Roshan like never before. Kangana even spoke about the mental trauma she had suffered after her break-up with Hrithik Roshan. Kangana Ranaut had unleashed her wrath and even made a startling revelation on a public platform that she was abused by Aditya Pancholi during the initial stage of her career. 6. Padmavati: Sanjay Leela Bhansali’s directorial Padmavati movie happened to be the worst controversy of year 2017. The Rajput community claimed that movie features dreamy sequence between Alauddin Khilji and Rani Padmavati. SLB’s explained numerous times that movie has not distorted any historical facts but the entire Rajput Sena roared against Padmavati movie’s release. The film, which was scheduled for release on December 1, was deferred. There were also death threats made to actress Deepika Padukone and Sanjay Leela Bhansali. 7. Harshvardhan Kapoor and Diljit Dosanjh: When Diljit Dosanjh was given Filmfare for Best Debut Male for Udta Punjab movie, Harshvardhan Kapoor showed his disapproval as he did not receive for Mirzya. The duo had a mouthful of fight over twitter but later Harshvarhdhan realized his fault and apologized to the Punjabi star. Have got more to add to the list? Tell us in the comments box. Next : ‘Wajah Tum Ho’ Singer Tulsi Kumar Blessed With Baby Boy, Names Shivaay!